Thermal Auricular Therapy is an ancient natural therapy involving the use of ear candles to help address conditions such as excessive or compacted ear wax, glue ear, sinusitis, rhinitis, ringing in the ears, congestion from colds/ flu, headaches and migraines. 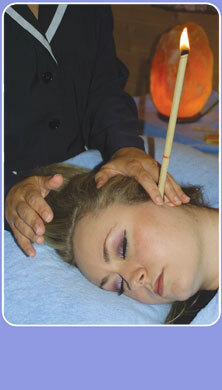 Ear candles have a purely physical function. A light suction generates a massage like effect on the eardrum, which releases blockages and balances pressure in the ears, forehead and sinuses. This treatment includes all the benefits of the Thermal Auricular Therapy with the addition of a facial cleanse, tone and a sinus massage. The massage reinforces the decongestive action in the sinuses and improves circulation to the skin.